The Holistic Parent is pleased to announce a new partnership with our friends from Pure Organic Foods. This partnership includes 15% OFF all Pure Organic Foods products, including their new line of food pouches, NutriChild, when you use the code HOLISTIC for any online order (free shipping over $50). Pure Organic Foods has launched their new line of products, NutriChild, with the intent to provide every Canadian parents with a healthy option to jump start their children’s healthy eating habit..
NutriChild is a Bolivian royal quinoa-based product that is gluten-free and specifically design for children between 6 months to 3 years of age. Quinoa is from the native ken wa which translates to “mother of grains” is the key ingredient for NutriChild. It’s perfectly balance ingredients, which includes a variety of fruits and vegetables, creates a super-food that’s packed with proteins, carbs, vitamins and minerals, all necessary for the healthy growth and development. Carlos Zamorano, founder and CEO of Pure Organic Foods, feels that a fear amongst brands and importers when it come to dealing with baby foods has actually left the segment unattended by non-traditional brands, thereby creating an opportunity for his brand to offer this new and exciting healthy option to parents. Quinoa’s popularity has rapidly been growing, and this demand has shifted the values on which quinoa was initially introduced to the market. Pure Organic Foods tries to bring those values back by sourcing only from Bolivia’s Uyuni Salt Flats (where royal quinoa is grown). Pure Organic Foods has been developing and strengthening their relationship with the farming communities in this area. “Keeping organic and GMO-free farming alive is challenging as the demands grow,” says Zamorano, who was born and raised in Bolivia. Keeping a sustainable supply chain has been one of the most difficult factors for this small company as they are focusing on the development of other product lines in addition to NutriChild, including cereals, grains, blends, mixes and ready-to-eat products. Quinoa is a great source of protein, and is one of the few plant foods that contains all nine essential amino acids. It also has almost twice as much fibre as other grains, which makes it great for babies with sensitive digestive systems, and in fact is listed by many nutritionists as a safe first food for babies at around six months old. Pure Organic Foods farm-to-table story is not only remarkable because of its dedication to company’s core values, but also because of their dedication to understanding the needs of new consumers and new market trends. Healthy consumers and millennials are the most demanding and educated consumers in the market place, and Pure Organic Foods definitely wants to stay at their top of mind and preferred brand. Pure Organic Foods success story is built on ethical business and a profound sense of respect for the environment, the growers and the customers. 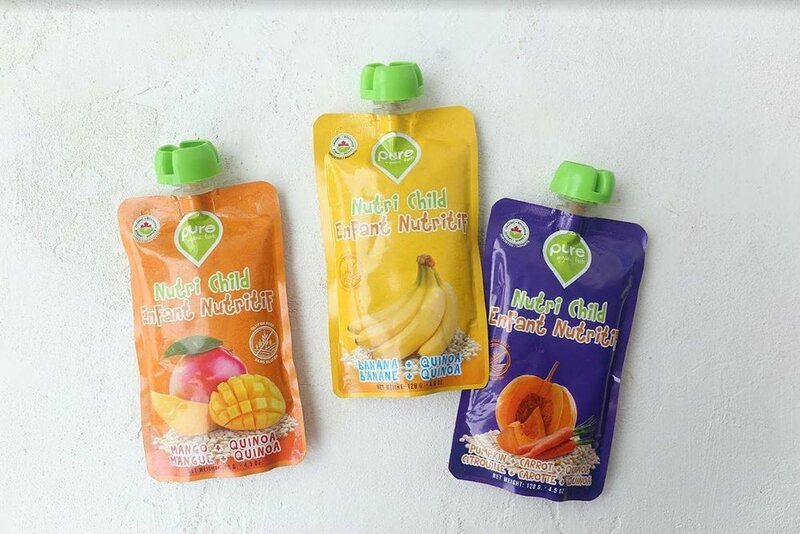 The launch of their new baby food line means health-conscious parents can introduce their children to the wonderful world of nutritious food with a top- quality formulation for the most demanding consumer. Elaine Kapogines is the publisher and owner of The Holistic Parent.